A major US media outlet has been caught passing on footage of Russian air raids in Syria as American airstrikes in a bid to advance Washington’s military agenda, a new report reveals. The US Public Broadcasting Service (PBS), aired a program on the Daesh (ISIL) terrorist group on November 19, purporting to show how their oil trucks were destroyed by US airstrikes, as part of Washington’s new plan to disrupt the group’s main source of income, according to the Information Clearing House. Earlier this week, the Pentagon said it would escalate its airstrikes on Daesh and bomb the terrorist organization’s oil infrastructure in Syria. The new operation is supposed to cripple eight major Syrian oil fields over the next several weeks, about two-thirds of which are said to be in Daesh’s hands. 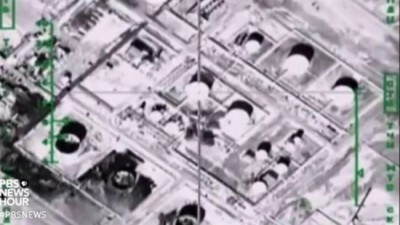 On November 16, the US military claimed it has destroyed 116 tanker trucks carrying stolen Syrian oil from those fields, but failed to provide video evidence. Two days later, however, the Russian Air Force destroyed some 500 oil trucks and promptly released footage of the airstrike. On November 19, a program dubbed PBS NewsHour used the Russian footage and passed them off as US airstrikes, without revealing the true source. “For the first time the US is attacking oil delivery trucks,” a voice-over said while the exact same video released by the Russian Defense Ministry was being shown. Daesh is reportedly generating as much as $40 million a month by producing and exporting oil it steals from the areas under its control. According to US military officials, the group operates a fleet of over 1,000 oil tanker trucks. US military officials say that they have studied eight major Syrian oil fields, namely Omar, Tanak, El Isbah, Sijan, Jafra, Azraq, Barghooth and Abu Hardan and are gearing up to inflict upon them the kind of damage which takes longer to fix or requires specially-ordered parts.